RB Browns Trucking has been hauling logs in and around the southern Oregon area since the 1950’s. We pride ourselves on being true to our word and showing up when and where promised. It’s hard to find trucks these days. But as a logger, you know that having trucking lined up is critical to a successful job outcome. We won’t promise you trucks and then leave you sitting with a bunch of logs decked and nowhere to turn. If you have a need for trucks… even if it’s out of our area… give us a call and we’ll try to figure things out. Even if we don’t get the job, we’ll try to help you find an alternative. Most of you that have been hauling around here know about RB Browns. And if you know about us, you know this: WE WORK YEAR ROUND. Versatility is key to our customers and to our drivers. If you are one of those guys or gals that is looking for year round work, there is a place for you here at RBB. Give us a call! 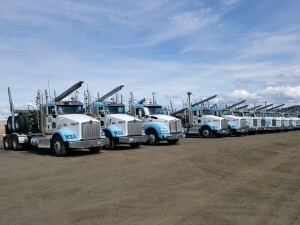 Today, R. B. Browns operates approximately 20 tandem log trucks throughout Southern Oregon and Northern California, carrying on the tradition of providing quality service at a reasonable price for our customers. For more information about logging, or to generate business please contact Mike Ziegler at 541-890-4708. For more information about chip trucks or to generate business please contact Silas Qualls at 541-531-9998 or apply on our Drivers Wanted page. © 2019 RB Browns Trucking.